This article is about the fictional Star Wars planet. For the disused asterism, see Al-Dhira'. For other uses, see Alderaan (disambiguation). Not to be confused with the star Aldebaran or an alderman. Alderaan is a fictional planet featured in the Star Wars franchise. It is blue-green in appearance, depicted as a terrestrial planet with humanoid inhabitants, and characterized by a peaceful culture. It is the home planet of Princess Leia Organa, one of the lead characters in the film series. In the original 1977 film, Alderaan is destroyed by the Death Star. The destruction of Alderaan is considered by some as an artistic depiction of the danger of nuclear weapons during the Cold War and some claim it is used as a pop-culture example of inadequate political and military action leading to negative effects. Early drafts of the Star Wars story include references to at least two planets which later evolved into the concept of Alderaan. Star Wars author George Lucas included a planet called Alderaan in early treatments; in The Star Wars (1973), Alderaan is a city-planet and the capital planet of the galaxy (prefiguring the planet Coruscant which later featured in the films). The draft script opens with a scene in which an "eerie blue-green" planet called Aquilae is threatened by an armed space fortress. In Lucas's 1975 draft, Adventures of the Starkiller as taken from the Journal of the Whills, Saga I: The Star Wars, the capital planet of Alderaan is described as a floating city in the clouds, "suspended in a sea of cirrus methane". 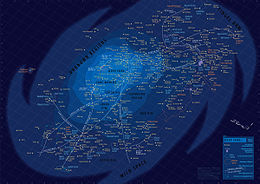 A planet described in Lucas's draft script as being "under siege by the Imperial Legions of Alderaan" and which is later destroyed is named as Ogana Major. Early sketches commissioned by Lucas from conceptual illustrator Ralph McQuarrie show a design which very closely resembles Cloud City, as featured in the later sequel, The Empire Strikes Back. In Lucas's third draft, the Imperial City of Alderaan has become the home world of the Sith Lords, and Darth Vader holds Princess Leia captive here. Lucas continued to hone his script, aided by screenwriters Willard Huyck and Gloria Katz; names of planets and characters were revised and the narrative was improved, and by the fourth draft, scenes on the Imperial capital planet had been moved to a space station called the Death Star and the peaceful world destroyed by the Empire had taken the name Alderaan. The on-screen depictions of Alderaan in the Star Wars films are scant; the distant planet is seen momentarily in Star Wars (1977) prior to its destruction, and in Revenge of the Sith (2005) a short scene shows a city amid a snow-covered, mountainous landscape. Alderaan was originally featured in the first film, Star Wars (later retitled Star Wars Episode IV: A New Hope), released in 1977. The opening scene depicts the capture of a small spaceship from Alderaan, the Tantive IV, by the Galactic Empire, and introduces the character of Princess Leia Organa, a princess of the Royal House of Alderaan who is played by Carrie Fisher. Alderaan appears in a later scene in the film, but is only shown on-screen in a distant view from space as the Empire's gigantic space station, the Death Star, moves into orbit around the planet. The battle station's commander, the Grand Moff Tarkin (Peter Cushing) orders the Death Star's superweapon to be fired at the planet. Alderaan explodes instantly in a ball of fire. It is later shown that the shattered planet has been reduced to a cloud of asteroids as the Millennium Falcon spaceship attempts to visit the planet. The destruction of Alderaan meant that it was not depicted in subsequent Star Wars films until the series of prequel films was produced. The planet made its first on-screen appearance since 1977 in Episode III: Revenge of the Sith (2005), appearing briefly at the end of the film. The adopted father of Princess Leia, Bail Organa (Jimmy Smits) is seen piloting a starship to the planet's surface, which is shown as a mountainous, alpine region covered in snow. Landing his ship in a citadel among the mountains, he brings the newborn Princess Leia into his royal palace. 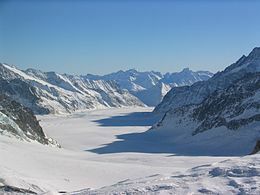 The backdrop for these scenes was created by compositing landscape footage of Grindelwald in Switzerland with CGI images of the city. The planet is not featured in the 2016 film Rogue One, but the character Bail Organa makes an appearance, stating that he will return to Alderaan to wait for his daughter, Leia, to bring the Jedi Master Obi-Wan Kenobi. This precedes the narrative of the 1977 film, A New Hope. In an episode of the animated television series Star Wars: The Clone Wars entitled "Assassin", Ahsoka Tano has premonitions of Padmé's death on Alderaan. The comic series Star Wars: Princess Leia (2015) deals with Princess Leia and Evan (a female rebel pilot also native from Alderaan), rescuing survivors from Alderaan's destruction. It also features a brief flashback to Leia's childhood on the planet and her relationship with her adoptive father Senator Bail Organa. Alderaan is mentioned frequently and also serves as a location in several works in the Star Wars Expanded Universe, the collection of books, comics and other material considered outside official canon, now branded Star Wars Legends. In various stories, Alderaan is presented as the home of the characters Tycho Celchu, and of Ulic Qel Droma who fought in the Great Sith War in 4000 BBY. [a] During the fall of the Empire, New Alderaan was named after Alderaan for the 60,000 survivors to start rebuilding the beauty of the original planet. It was also said that the planet was colonized just after the formation of the Rakatan Infinite Empire. In Michael A. Stackpole's 1998 novel, I, Jedi, Alderaan features as the sanctuary of the Caamasi when their home world of Caamas is devastated by the Galactic Empire. Alderaan is featured in a 1991 role-playing game, Graveyard of Alderaan (part of Star Wars: The Roleplaying Game). It describes how, after the Clone Wars, Alderaan's massive war machine was dismantled, and the weapons were placed aboard an armory warship called Another Chance. The ship was programmed to continually jump through hyperspace until called home by the Alderanian Council. The 1981 NPR/BBC radio drama adaptation of Star Wars features scenes set on Alderaan, in which Princess Leia discusses her mission to acquire the Death Star plans from agents of the Rebel Alliance with her father, Bail Organa (Prestor Organa). In a later scene, she is confronted by the Imperial commander Lord Tion and accused of treason. In Alan Dean Foster's 1976 novelization of the original film, Alderaan is described as a "small green gem of a world". The planet appears more substantially in Star Wars reference guides to fictional locations, such as Kevin J. Anderson's The Illustrated Star Wars Universe (1995) and Wallace, Kolins and McKinney's Star Wars: The Essential Guide to Planets and Moons (1998). According to these books, Alderaan is covered by wild grasslands, plains, forests and mountain ranges. The planet has no ocean, but has a semi-frozen polar sea, and thousands of lakes and rivers. It is rich in biodiversity, populated by a wide variety of flora and fauna, such as the nerf and the thranta. Human life on the planet is evidenced by a number of cities, built to harmonize with the natural environment such as on canyon walls, on stilts along the shoreline or under the polar ice. The capital city, Aldera, has been built on a small island in the center of a caldera. The Alderaanian people value arts and education highly, and place high importance on their participation in the Galactic (later Imperial) Senate and the promotion of peace through demilitarization. The largely democratic society is formed as hereditary constitutional monarchy, ruled by the King or Queen of Alderaan from the Royal House of Antilles and later, due to marriage, the House of Organa. The planetary government is the High Council of Alderaan, presided over by a First Chairman and Viceroy. ^ a b c "Databank: Alderaan". StarWars.com. Lucasfilm. Archived from the original on April 23, 2016. Retrieved April 20, 2017. ^ Klein, Christopher (December 17, 2015). "The Real History That Inspired 'Star Wars'". History. Retrieved December 30, 2018. ^ Rinzler 2008, pp. 351–400. ^ Hearn 2005, pp. 86–87. ^ Bouzereau 1998, pp. 67–68. ^ Stephens, Thomas. "Giving Swiss film locations some direction". SwissInfo.ch. Retrieved 1 July 2012. ^ "Databank: Bail Organa". StarWars.com. Lucasfilm. Archived from the original on 8 April 2017. Retrieved 21 April 2017. ^ "Comic Book Review – Star Wars: Princess Leia #1-5". 10 July 2015. ^ Robb, Brian J. (2012). A Brief Guide to Star Wars. London: Hachette. ISBN 9781780335834. Retrieved 18 January 2017. ^ Daley, Brian (1995). Star Wars: The Original Radio Drama. London: Titan. ISBN 9781852866280. ^ Lucas, George (2011) . A New Hope: Star Wars: Episode IV. Random House. p. 113. ISBN 0-345-34146-5. ^ a b c Anderson 1995, p. 189. ^ a b c d Wallace, Kolins & McKinney 1998, pp. 6–7. ^ Anderson 1995, pp. 193–94. ^ Anderson 1995, pp. 192, 195. ^ Anderson 1995, pp. 198-201. Bouzereau, Laurent (1998) . Star Wars: The Annotated Screenplays (1st UK ed.). London: Titan Books. ISBN 9781852869236. Hearn, Marcus (2005). The Cinema of George Lucas. New York: Harry N. Abrams. ISBN 9780810949683. Wallace, Daniel; Kolins, Scott; McKinney, Brandon (1998). Star Wars: The Essential Guide to Planets and Moons (1st ed.). New York: Ballantine Pub. Group. ISBN 9780345420688. Windham, Ryder (2015). Ultimate Star Wars. DK. ISBN 9781465436016. Retrieved 21 April 2017. This page was last edited on 18 April 2019, at 21:45 (UTC).